Welcome to my website, and to the chance to enjoy an improved quality of life. I offer acupuncture, shiatsu and tuina (Chinese massage) treatment in Exeter, from a tranquil clinic adjoining the university campus. I do it because I greatly enjoy practising a medicine which looks at the whole of you and which encourages your body to heal itself. I will treat you, and not just your illness. 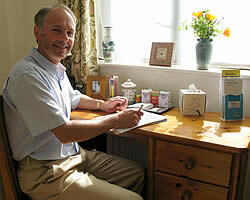 To book an appointment now, or for friendly advice about any condition, you can telephone me on 01392 424276. Gentle introductory treatments for new or anxious patients. Clinic Hours: 8.00am to 6.00pm Monday to Friday. For monthly tips on healthy living and health research, you can Like my Facebook Acupuncture Page.